No matter the customer or the dollar amount of their order, Bob Parlee’s unwavering mission is always the same: Build the best performing bike possible. Period. This testing task is accomplished through a combination of master craftsmanship, unyielding attention to detail, and total pride in finished product. Bob wouldn’t do things any other way, and that’s why his name — and reputation — is attached to every bike we build. Parlee’s unmatched customization ability is the end result of a multi-tiered process that begins with one simple edict: listen. Parlee understands that the most important aspect of the custom bike-building process is communication between rider the fitter and us, the builder. If you’re considering a custom bike, call us. We’re here five days a week and are always happy to explain how our custom bike-building process works so well. We work with the finest retail and fitting partners around the world using a highly-refined design process that ensures perfection. Parlee can alter frame geometry by as little as 0.1-degree of angularly and one millimeter linearly. This allows us to accommodate virtually any rider type and riding style. Full custom geometry is available on our Z-Zero, Z-Zero DISC, Z-Zero XD (CX, Gravel or Commuter spec), Z1, Z2, Z3, Track, platforms. And all custom designs are created using our proprietary Computer-Aided-Design system, which models all rider contact points and aligns it with actual frame geometry to assure a flawless finished product. These drawings are available to all clients via PDF email. 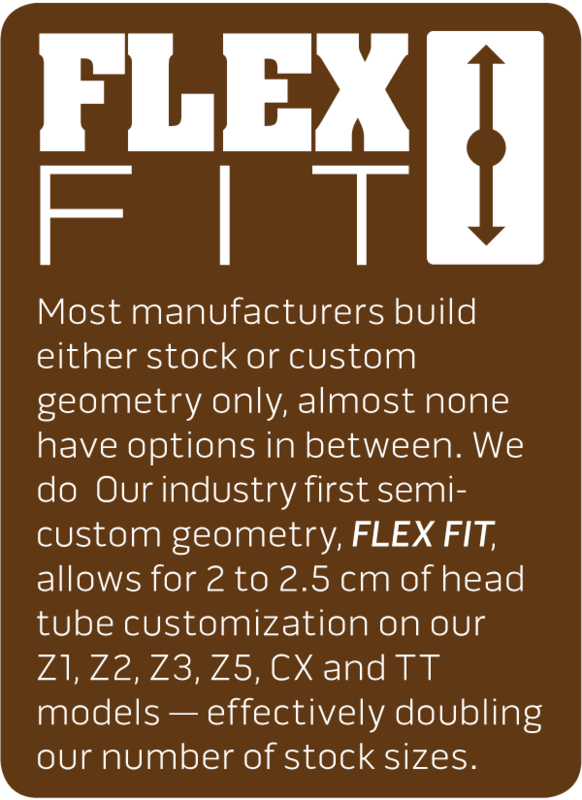 Of course, not all riders require full custom geometry, and that’s why our line also includes an array of stock and Flex Fit models. No matter the case, we’ll work with you to build the perfect bike. Consider the adjectives that describe a bike: stiff, smooth, comfortable, responsive, stable. Each is subjective, resulting from that bike’s tube diameter, tube length, fiber composition, fiber orientation and angular permutations. Understanding the delicate dance of these variable characteristics is knowledge only attained through years of hands-on observation. For more than a decade, Parlee has collected and disseminated data from a broad spectrum of riders. In turn, this information allows us to precisely tune each bike to each rider’s individual needs. The is a marked departure from standard industry practice, where bikes are designed based on the law of averages, which as you might expect, yields an average bike. NOTE: All tube sets are custom blended (at no extra charge) on Z-Series bicycles to perfectly meet each riders needs. Call us to discuss your perfect tubing set up. Tubing is made in house, here in Beverly, MA by our frame builders to Bob’s exacting designs. Parlee and our dealers offer high-end Shimano, Campagnolo and SRAM build kits, plus componentry from ZIPP, HED, Mavic, ENVE, and other bike part manufacturers. If you can dream it, we and our retail partners can build it. Unlike the bike-building behemoths, Parlee is a nimble operation, capable of creating a bike that meets your exact wants and needs. Parlee can customize a vast range of fittings and interfaces. Options include English bottom bracket threading, or our open standard Press-Fit 30 designs. Parlee can also modify cable stop placement, route Di2 or EPS internally, build eTap frames with no drillings and add eyelets, pump pegs and bottle mounts. Racks, fenders, power meter sensors and other mounts are all options. Frames can be outfitted for our standard 31.6mm seat posts, the retro 27.2 sizing and a variety of integrated seat posts. Parlee’s unique build-to-order process includes full customization of the finish process. Choose your paint scheme and color, then select from our broad array of decal choices and panel themes. The only limitation is your imagination. If you need a hand, or simply want to bounce around ideas, all Parlee dealers can work with you to create a unique and eye-catching design. And just so there are no surprises, each customer receives as what-you-see-is-what-you-get PDF so they can inspect and approve each detail of their custom bike.